Photograph the most variety of Kauai's beauty possible in a single day! Hands-on instruction with an experienced professional photographer. Having sunrise and sunset at different locations and utilizing the best kind of light twice in one day. Valuable knowledge relating to professional camera technology, conceptual critiques, digital post-production, workflow & on-location shooting experience. Our single day workshops are intense, fun, and highly educational! This is a great way to hone your photography skills with a group! Our goal is to not only focus on fine art landscapes, but tackle a broad variety of subjects and aesthetic styles. This workshop is designed to familiarize you with a variety of photographic opportunities one might encounter while traveling, from landscapes, to food, to macro, to editorial, to lifestyle and people! Whatever might present itself to our group on that particular beautiful day in Kaua'i. We are not like a photography tour. We will not rush you around from place to place. 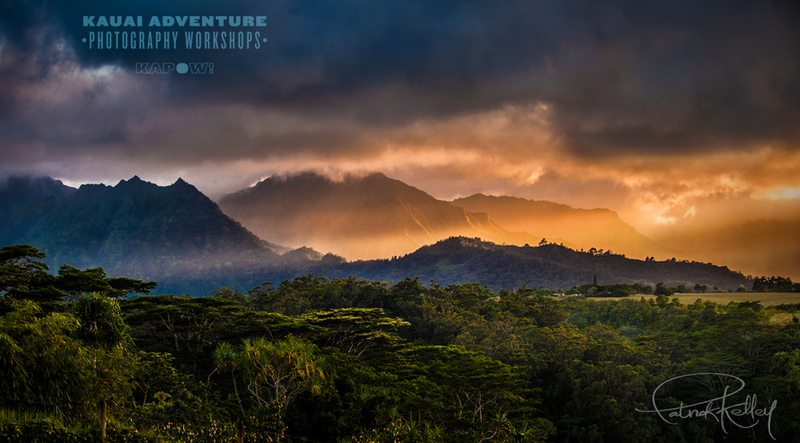 This workshop is for photographers that want to capture the best images possible during your visit to Kauai. We will explore off-the-grid locations to find hidden or unique image possibilities. We will challenge you to push yourself and improve as a result. We make sure that our itinerary is flexible so we can adapt to changing lighting conditions to get the best images in the right place at the right time. These adventures are always unique and no two are ever the same! This workshop is an amazing day that starts early. We will be starting before sunrise to shoot and explore all morning. We will meet at Starbucks in Kapaa (4-831 Kuhio Highway #208 Kapaa, HI 96746). From there we will carpool to a great location (depending on what is best for that morning) to photograph the sunrise. Whether it's seascapes or mountains, we'll stay after the sun rises to make sure we're not missing any rainbows! We take a break for lunch and regroup again in the afternoon when the light is best for a jungle waterfall or a ridge walk for better vantage points. Be prepared for 6 hours of exploring! Whether we have a model for us to swing on vines and jump off waterfalls, or photographing endemic Kaua'i flowers and fungi with a macro lens, there is so much to work with! We'll finish off the day with an amazing sunset location, focusing on the various styles of photography that one can utilize with dramatic lighting. We specialize in fun and adventure, and we seize any photographic opportunities we may find between! Our goal is not to limit ourselves to one branch of shooting, but to teach the mindset of being able to photograph whatever you might come across in your travels with confidence and style. Check out the the workshop gallery to get an idea of what kinds of shooting we'll be doing along the way, and register for your workshop today! We'd love to take you from A to Z with your images. From capture to final processing and publishing! Book the Post-Production workshop for after your shooting adventure for the full "KAPOW" experience. 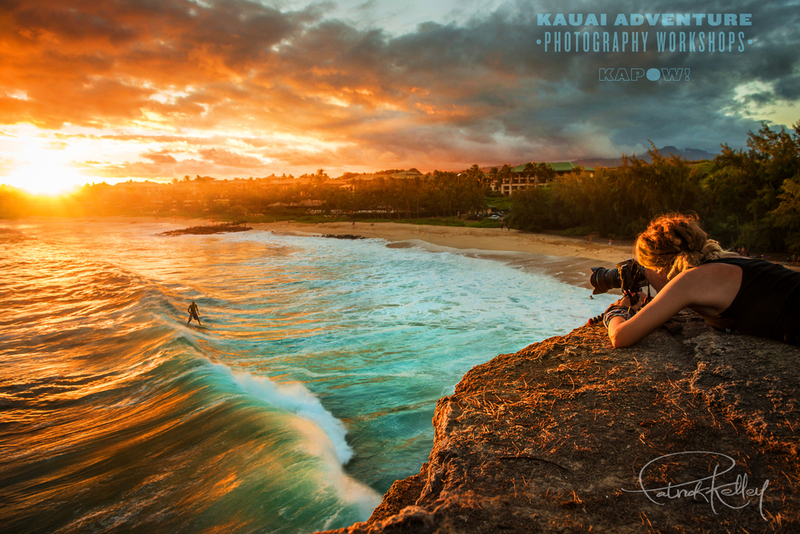 "This class exceeded my expectations and I can't recommend Kauai Adventure Photography highly enough. Beginners through advanced, if you want to improve your photography skills and have fun doing it, don't miss this opportunity on Kauai."